With Vector Institute co-founder Richard Zemel joining as an advisor, integrate.AI is hoping to position itself as a leader in ethical AI. integrate.AI helps large B2C enterprises use AI to comb through social media, alternative data, and first-party data to personalize experiences with customers. The company—which has been outspoken about the need for businesses to think about social good in the past—will use Zemel’s expertise to explore privacy and fairness in AI, while the Vector Institute has the opportunity to test their research with enterprises. In addition to his work at the Vector Institute, Zemel is also a senior fellow at the Canadian Institute for Advanced Research and co-chief of machine learning at the Creative Destruction Lab. However, Zemel said that integrate.AI’s work with ethics, privacy, and fairness directly intersect with his research interests. As the company works with large datasets, Zemel indicated that it can access real-life data to build AI applications that maintain privacy for users without losing out on performance. It’s also a way to explore the challenging question of what it means to build ethical AI without algorithmic bias—one that giants like Facebook, Amazon, and Google are currently struggling with. Kathryn Hume, VP of product and strategy at integrate.AI, said that the company’s clients are increasingly seeking help on developing an ethical AI framework; she recently revealed the first version of a framework at the RightsCon conference aimed at getting expert feedback. 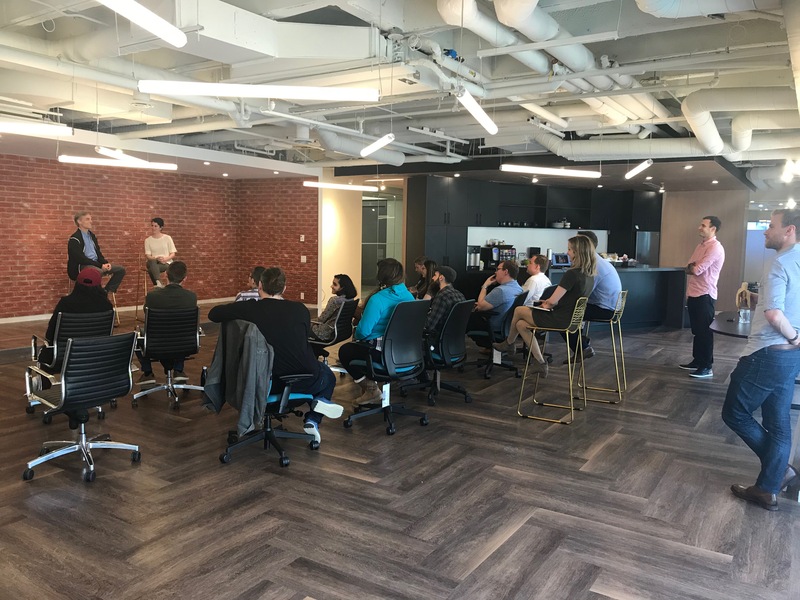 Richard Zemel talks to the Integrate.AI team. For integrate.AI, working with Zemel means working with an expert in areas like transfer learning and “datasets that may not have perfect conditions for standard techniques,” said Hume. Zemel is currently in the early days of working on an AI-focused fairness research project with integrate.AI, which is leveraging data from insurance company and client Kanetix. integrate.AI first announced its partnership with Kanetix in early March, predicting which customers were most likely to be interested in an offer, and is now working with Zemel and his students to see if these algorithms are biased based on gender or income level. Besides positioning itself as a leader in ethical AI, integrate.ai’s work with Vector Institute is part of a push to make Canada a global leader in AI as more international tech companies set up shop to tap into talent in the region.